The era of computing technologies based on charge currents is coming to an end after more than 40 years of exponential increases in computing power that have been largely based on shrinking devices in two dimensions. A new era of “Beyond charge!” will evolve over the next decade that will likely be based on several new concepts. Firstly, devices whose innate properties are derived not from the electron’s charge but from spin currents and from ion currents. In some cases new functionality will arise that can extend charge based devices but in other case fundamentally new computing paradigms will evolve. Secondly, devices will inevitably become three-dimensional: novel means of constructing devices, both from bottom-up and top-down, will become increasingly important. Thirdly, bio-inspired devices that may mimic the extremely energy efficient computation systems in the biological world are compelling. In this talk I will discuss possible spintronic and ionitronic devices and how they may lead to novel computing technologies. 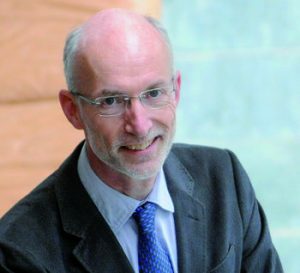 Stuart Parkin is the Managing Director of the Max Planck Institute for Microstructure Physics, Halle, Germany, and an Alexander von Humboldt Professor, Martin Luther University, Halle-Wittenberg. His research interests include spintronic materials and devices for advanced sensor, memory, and logic applications, oxide thin-film heterostructures, topological metals, exotic superconductors, and cognitive devices. Parkin’s discoveries in spintronics enabled a more than 10000-fold increase in the storage capacity of magnetic disk drives. For his work that thereby enabled the “big data” world of today, Parkin was awarded the Millennium Technology Award from the Technology Academy Finland in 2014 (worth 1,000,000 Euro). Most recently, Parkin proposed and demonstrated a novel memory device, “Racetrack Memory”, that is an innately 3D solid-state device with the storage capacity of a disk drive but with much higher performance. Parkin is a Fellow/ Member of: Royal Society (London), National Academy of Sciences, National Academy of Engineering, German National Academy of Science - Leopoldina, Royal Society of Edinburgh, Indian Academy of Sciences, and TWAS - academy of sciences for the developing world. Parkin’s awards include: American Physical Society International Prize for New Materials (1994); Europhysics Prize for Outstanding Achievement in Solid State Physics (1997); 1999-2000 American Institute of Physics Prize for Industrial Application of Physics; 2008 IEEE Daniel E. Noble Award; 2009 IUPAP Magnetism Prize and Neel Medal for outstanding contributions to the science of magnetism; 2012 David Adler Lectureship Award; 2012 von Hippel Award from the Materials Research Society; 2013 Swan Medal of the Institute of Physics (London); Alexander von Humboldt Professorship − International Award for Research (2014); ERC Advanced Grant - SORBET (2015).